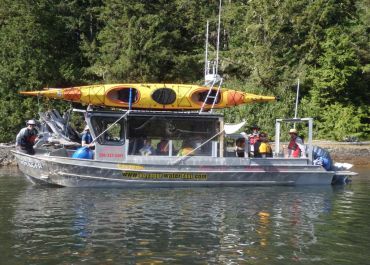 Getting to and from Courtenay, Comox, or Campbell River on central Vancouver Island, then out to our Wilderness Kayaking Retreat base camp on Spring Island, on the remote Northwest coast of Vancouver Island, is a scenic experience and part of the adventure! Once with us on the west coast, your adventure unveils a refreshing Base Camp Kayaking or Expedition Kayaking experience that connects you with the area, or a Themed Experience from our Wilderness Retreat, enjoyed with family, friends, or colleagues. Make the great stuff happen! We're biased, but are convinced the journey is worth it! For most of our trips, once you get yourself to the Comox Valley (Courtenay/Comox) or Campbell River areas, located on Central Vancouver Island, we provide early morning van transportation pick-up (approx. 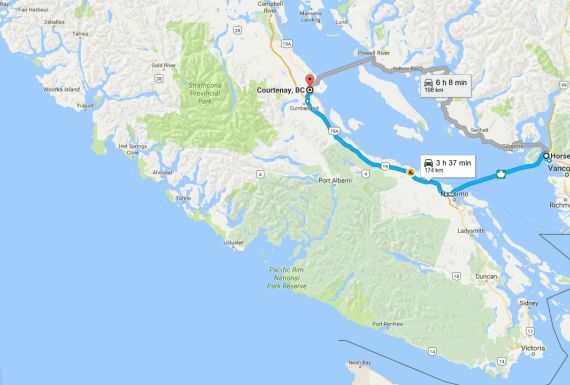 between 7:00 – 8:30 a.m.) for the scenic drive on northern Vancouver Island to Fair Harbour (approx. 5 hrs.) to meet your water taxi for transfer to our Wilderness Retreat (approx. 45 mins. ), arriving mid-afternoon. 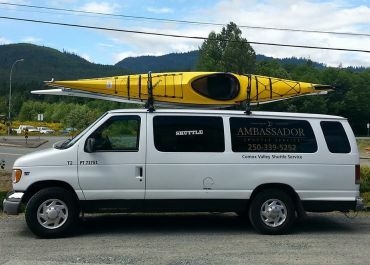 On the last day of your tour, our van shuttle will return you to your accommodations, the Campbell River or Comox Valley Airport, or your float plane departure point (approx. between 5:30 and 6:30 p.m.). Otherwise, if on the Sea Kayak Fishing Tour, a Custom Group Tour (and the van shuttle is not included), or opting to drive yourself (e.g., if bringing your own kayak), then here are instructions for Driving Yourself to Fair Harbour. Board BC Ferries from Vancouver to Nanaimo (Tsawwassen to Duke Point, 2 hrs. ), or West Vancouver to Nanaimo (Horsehoe Bay to Departure Bay, 1.5 hrs.). From Nanaimo follow the signs to Highway 19 North towards Courtenay/Comox (1 hr 15 min.) or Campbell River (1 hr 40 min.). 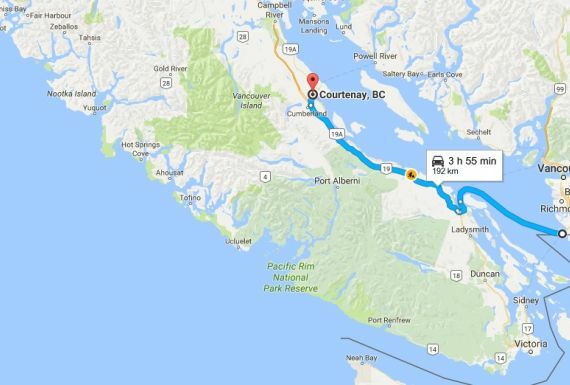 If Courtenay/Comox is your pre-trip destination, then take exit 117 to Highway 19A north. Continue along the Comox Valley Parkway to Cliffe Avenue towards your accommodation of choice. 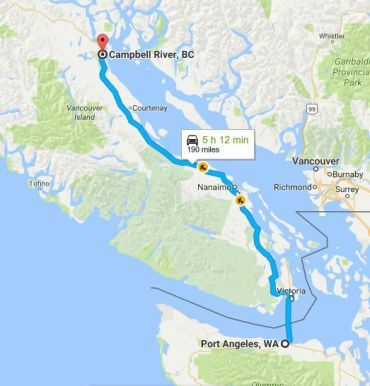 If Campbell River is your pre-trip destination, then continue on Highway 19 North towards your accommodation of choice. Board the M.V. Coho Ferry from Port Angeles to downtown Victoria, BC (1.5 hrs). From downtown Victoria, follow the signs to the Trans-Canada Highway/BC Highway 19 North towards Courtenay/Comox (2 hrs. 40 mins.) or Campbell River (3 hrs.). We recommend that you arrive the day before your trip starts because of the early van shuttle departure time on the first day. We also suggest not making any ferry reservations on the last night in case weather or other variables delay your return from Kyuquot. Please tell us if this is unavoidable and we will do our best to make it work for you. Fly direct to the Comox Valley via the Comox Valley International Airport (YQQ), or Comox Harbour (seaplanes); or to Campbell River via the Campbell River Airport (YBL), or Tyee Spit Seaplane Base. All air travel destinations are easily accessed with scheduled flight options from Vancouver International Airport (YVR), Vancouver Harbour Flight Centre (seaplanes), Victoria (YYJ), Calgary (YYC), and Edmonton (YEH). Most arrival and departure times for flights will require an overnight stay in Campbell River or the Comox Valley pre- and post-trip. Enjoy one or more nights with friends, family, or at other local accommodations - there are many great B&B's and hotels to choose (including some with preferred rates for our guests, with details available upon booking your trip with us). Most accommodations have shuttle services to/from the airports. Many of our guests enjoy and appreciate the journey of getting to our remote location. 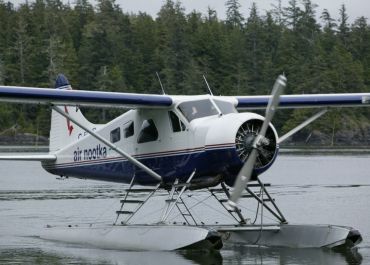 However, if time is of the essence, charter float plane service can be arranged from most places on the BC coast directly to Kyuquot Village or our location on Spring Island. Please contact us to discuss options. We recommend that you arrive the day before your trip starts because of the early van shuttle departure time on the first day. We also suggest not making any flight reservations on the last night in case weather or other variables delay your return from Kyuquot. Please tell us if this is unavoidable and we will do our best to make it work for you. The Island Link Bus and Tofino Bus offer pick-up and drop-off service at several locations on Vancouver Island, from Victoria to Campbell River. Some of our guests who are more local to Vancouver Island, familiar or comfortable with driving to Fair Harbour Marina, and have a suitable vehicle for driving on gravel roads, may choose to opt out of our van shuttle and drive themselves. Driving yourself can save you a little on the trip package price. This option may appeal to you if you are bringing your own kayak, and/or planning your kayak vacation with other activities on northern Vancouver Island and wanting the independence of your own vehicle. If choosing to drive yourself to Fair Harbour, please let us know at the time of booking and we’ll provide you with the necessary information and adjust your trip pricing accordingly. My 7th visit to Spring Island over the years was truly exceptional. It is a long journey to reach this beautiful isolated spot from California but so worth it. Regardless of how you travel to Vancouver Island and remote Kyuquot, you'll truly arrive when stepping into the shin-deep water lapping the cobblestone beach at our Wilderness Retreat on Spring Island, your base for a spectacular west coast kayaking adventure!